Super Eagles captain Mikel John Obi has been ruled out for the remainder of the CSL season after picking up a muscle injury in training. The Super Eagles skipper did not participate in full training on Tuesday but jogged on the sidelines, fueling speculation that he is not in good physical condition. The injury will come as a big blow for Tianjin coach Uli Stielike who will no doubt miss the services of the experienced midfielder with Tianjin Teda desperately looking for a win having gone their last 11 matches without a win. Mikel hoped that his side will beat the drop despite their poor run of form. “We are in a difficult situation right now. We know the importance of the remaining matches. I’m solidly behind the team and I believe the guys will do the job on the pitch and ensure we remain in the top flight,” Mikel said. 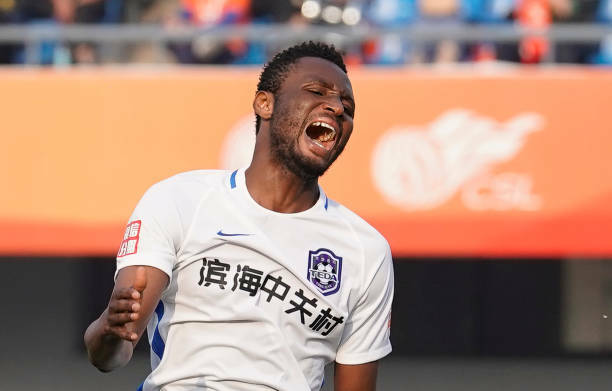 Mikel has featured in 18 league matches this season, scoring two goals and also setting up another 2. He has, however, had physical and fitness issues since returning from the World Cup and has been limited to just 7 appearances compared to the 11 he featured in before the World Cup. Tianjin is currently 15th on the 16 log table with 29 points from 28 points, level on points with Chongqing who currently occupy the 14th position on the table.